Landscaper in Salem - Cochran Landscape Management, Inc.
We have worked to develop a strong sense of trust and commitment for over 13 years throughout the greater northwestern part of the state. The community is known for its passion for nature, wildlife, scenic vistas, and outdoor activities, which is why we know the landscaper Salem loves working with is Cochran Landscape. We understand your personal desires and dreams when it comes to the overall appearance and functionality of your landscaping needs, which is why we work with you step by step until you are 100% satisfied. 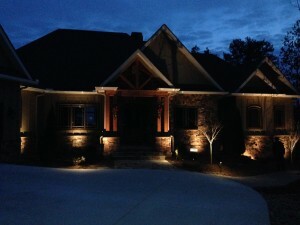 We offer various services including landscape lighting, irrigation system management, design, and repair and much more! Looking for a town with a strong sense of community and friendship? Look no further than the quaint town of Salem, South Carolina! The community is passionate about their nature, wildlife, scenic vistas, outdoor recreational activities, hunting and fishing. A relatively new town, meaning “City of Peace,” used to be part of older townships until December 1951. 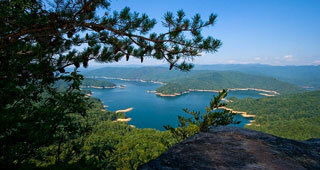 Much of the history relates to Indian legend and heritage due to its location in the Jocassee and Boone’s Creek areas. To further emphasize their true dedication to helping one another, Salem holds various events to help support their town, such as raising money to help send high school athletic teams to state competitions. The overwhelming support of the community is truly remarkable, as the small community is home to 135 people. 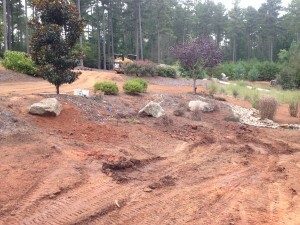 Recently Cochran Landscape was contacted by a homeowner in Salem. The new homeowner had gotten rid of a shed that was on the property and he replaced the space with fresh grass. He thought it looked plain, though, so he called us for our services as a trusted Salem landscaping company. The Cochran Landscape designer met with the homeowner and we went through some options that would spruce up the area. The homeowner let us know that he was on a budget and could he do this with the budget he was working with. We let him know that we would make sure not to go over his budget and provide him with the best landscaping that he would be proud of. The landscaping crew arrived at the customer’s home and started adding plants in the surrounding area, which were very eye catching and easy to maintain for the customer. Just by adding the plants the plain space was spruced up and looking great. The customer returned home just as the crew was getting ready to leave and when he seen the landscaping he was left speechless. The customer said he it was exactly what his landscaping needed. The customer said that Cochran Landscape is the only landscaping company Salem homeowners can trust to do the best landscaping, because we understand a budget and can amazing landscaping without going over the budget. 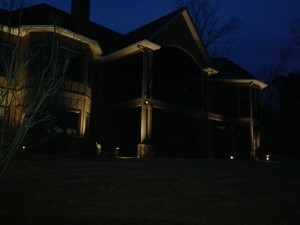 The customer thanked us repeatedly and plans on calling Cochran Landscape in the future to add landscape lighting. Cochran Landscape received a call from a man in Salem. The man was a lawn enthusiast. He loved keeping his yard looking great. He had flowers and plants that he had planted all around his home and he loved working in his yard. The Salem man explained that he had gotten a new job and it was causing him to work a lot of overtime than he had originally anticipated. He said the checks were great, but it left him very little time to water his lawn, and the appearance of his grass and plants were starting to suffer. He called Cochran Landscape to see about getting an irrigation system Salem residents can count on. The Cochran Landscape specialists met with the homeowner to look over his lawn, then to go over irrigation systems that would provide his lawn the watering that it needed. The homeowner agreed with our recommendations, then had us install the irrigation system. Our installers returned to install the irrigation system, and by the end of the day the system was installed. Now all he has to do is worry about the great joy of mowing his lawn on his day off, because the irrigation system we installed is keeping his lawn watered and growing. His yard looks great thanks to the Cochran Landscape irrigation system experts in Salem. Cochran Landscape has been providing Salem homeowners with efficient and trustworthy irrigation systems to keep their lawn watered and looking wonderful. An avid gardener loved growing things. She, along with the help of her husband and kids had built the garden from a few planter boxed to quite a large expanse. She was so great at growing things that the garden was starting to take over her yard. She also loved flowers, and had quite a bit of floral landscaping designed by Cochran Landscape. To show off the fruits of her labor (besides the delicious produce) they decided to build a retaining wall to exhibit the garden and to keep out the increasing number of pests. She contacted the Cochran Landscape team to help her family design a retaining wall, and then build it for them. 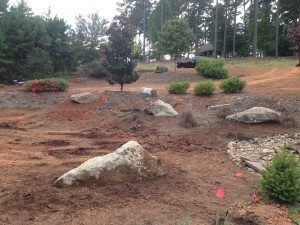 The Cochran Landscape design team met with the family to see what type of retaining wall they wanted. The Cochran Landscape team can bring all types of landscaping elements together to create different shapes, lines, and shapes with the retaining wall. The family selected several different types of natural stones, and said they wanted it two feet high. They scheduled us to start on the project on Monday, and our team showed up and started on the wall. By Friday, the retaining wall built, and we featured the garden with the wall. Both parents were overjoyed with the finished look, and the mother said she is planning on adding new plants that will look fabulous in that area. The entire family is glad that they called Cochran Landscape back again to help them with their landscaping. Cochran Landscape is the retaining wall Salem homeowners and avid gardeners can really appreciate. A Salem construction manager was starting to think his system of buying hoses and using them until they were completely worn out was not the best way to go about things. He was untangling a hose for the nineteenth time until he got fed up and dropped all of it to called Cochran Landscape to find out how much the most efficient sprinkler system Salem had seen would cost. Cochran Landscape is the sprinkler system specialists. Our irrigation specialists are highly qualified and trained to install, repair, and maintain all sprinkler systems, and we can custom design a sprinkler system to meet the needs of each homeowner. We went over several sprinkler systems with the construction manager, then designed one that would work for his property. He liked the price that we quoted him, and asked us to start on the project immediately because he was tired of wasting money on hoses. Our sprinkler specialists arrived at the Salem home, and started installing the sprinklers. Our team worked continuously until the system was successfully installed, and then we turned it on to make sure it was done successfully. We called the customer to let him know that the project was completed, and asked him to let us know if he had any problems.We assured All of our work is backed with a warranty. The customer was very satisfied with the price and level of service, and did not regret purchasing his new Salem sprinkler system with Cochran Landscape. Last week Cochran Landscape provided services for a doctor and his wife looking for a landscape company in Salem. 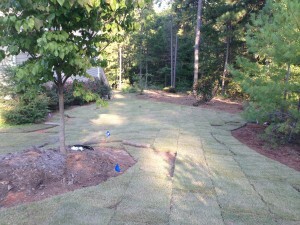 The doctor and his wife contacted Cochran Landscape for assistance with their Salem landscaping design. The couple enjoyed throwing parties, barbecuing, and just sitting out on their patio. One of their problems was that they didn’t have the privacy they wanted. The couple didn’t want to put up a privacy fence, so we met with them to get an idea of exactly what the couple wanted with their landscaping. The first thing the couple wanted was a paver patio. Their current patio furniture was being placed directly on the ground. 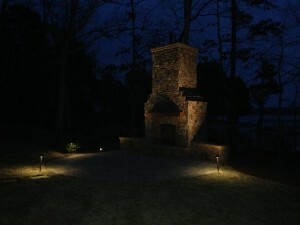 We suggested several options in pavers, and the couple selected one that would match their home. For privacy the designers suggested hedges around the patio. The hedges would provide the privacy they wanted while also adding aesthetic value to the property. 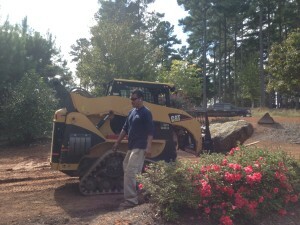 The Cochran Landscaping crew arrived at the home and started installing the paver patio. The ground was prepped, then the pavers were added. Once the pavers were in place, the crew installed the hedges around the patio. When the crew finished the landscaping work we invited the doctor and his wife to look over the work. The couple was ecstatic. They said that the landscape design was exactly what they were looking for. The couple said they were already planning a barbecue for the following Saturday so they could show off their new patio and landscaping. Not only do we provide lawn maintenance, landscape lighting but also irrigation and repair. For more information on our services at Cochran Landscaping, click here! Our customers from Salem, South Carolina, Jim and Nancy Turner, were the couple that we met while working on a different job in the same sub-division. They saw our work and were in interested in our services. They were looking to enhance the whole look and feel of their current property, which we suggested by doing so with boulders and sod. 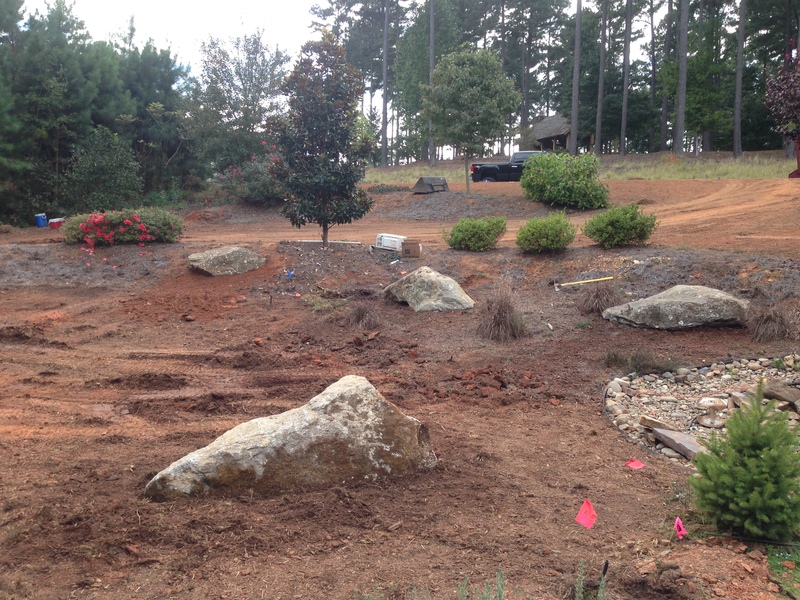 Jim said that our crew did a nice job and they love the way the boulders give our yard a natural look and the way that they tie into the landscape seamlessly. Nancy commented, “Great job! We will definitely use Cochran Landscape for all of our future outdoor projects.” To see our work, check out the images below! To learn more about the services that we provide to improve your landscape, click here! 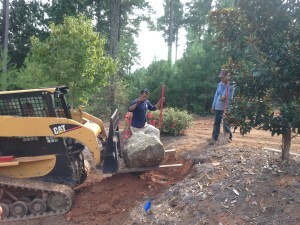 At Cochran, we provide boulder installation services which can help the overall aesthetic of the property in various ways. In Salem, we installed boulders to help in erosion control and provide a more appealing look to the property as well.